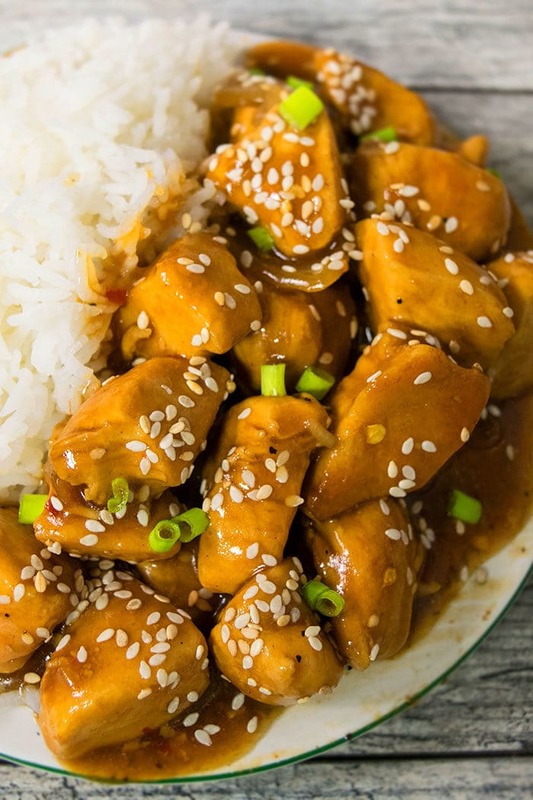 Quick and easy honey sesame chicken recipe, made with simple ingredients in one pot, over stovetop. A 30 minute meal- Sweet, spicy, sticky, healthier than Chinese takeout. This Chinese chicken is the best. It’s juicy and tender and coated in a sweet and spicy sauce. There is no frying and it’s easy clean up. 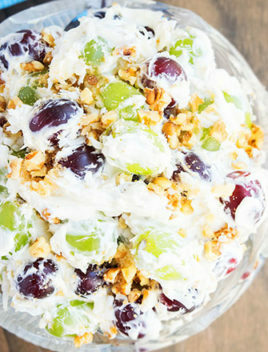 It’s a healthy or skinny copycat version of what you get at P.F. Chang’s or Panda Express. Typically, small chicken breast pieces are used but you can also use wings, drumsticks or thighs. My family loves this just as much as this Black Pepper Chicken (One Pot) and this Cashew Chicken (One pot). Also, traditionally, this chicken is crispy since it’s coated in tempura batter and fried. Then, it’s mixed in with the sauce. However, I feel that requires unnecessary steps and takes longer plus the chicken in the leftovers becomes soggy and disgusting. What is the difference between sticky Chinese sesame chicken and orange chicken? Both and sweet and made in a very similar method. However, orange chicken also has orange zest and orange juice and has a subtle fruity flavor. 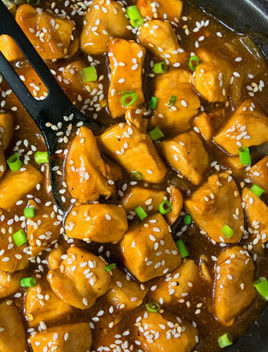 How to make sesame chicken stir fry? Add ginger, garlic, soy sauce, vinegar, hoisin sauce, honey, sriracha sauce, brown sugar, salt, pepper and mix until combined. 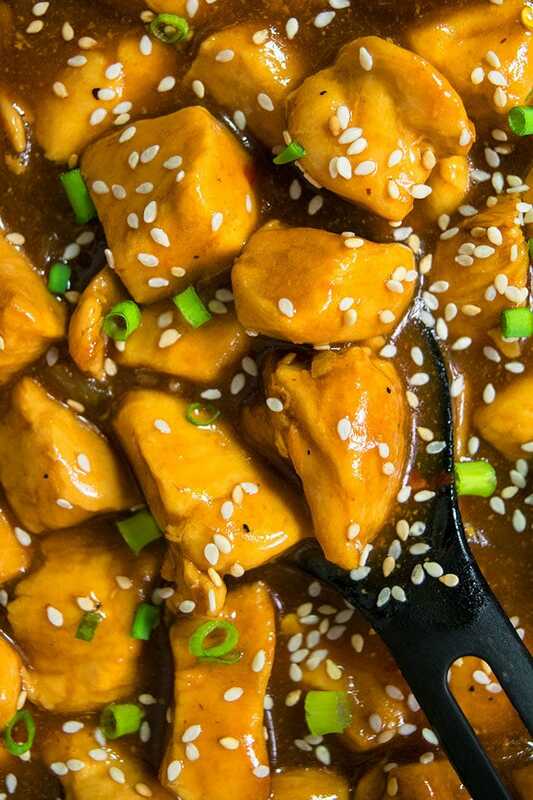 What to serve with healthy sesame chicken? Rice– Boiled jasmine rice is a great option. Fried rice– Vegetable fried rice is delicious or even cauliflower fried rice. Noodles– Egg noodles and spaghetti taste awesome. Zoodles or zucchini noodles– Another healthy alternative. Instant pot spaghetti squash– This is another low carb, healthy alternative to pasta. 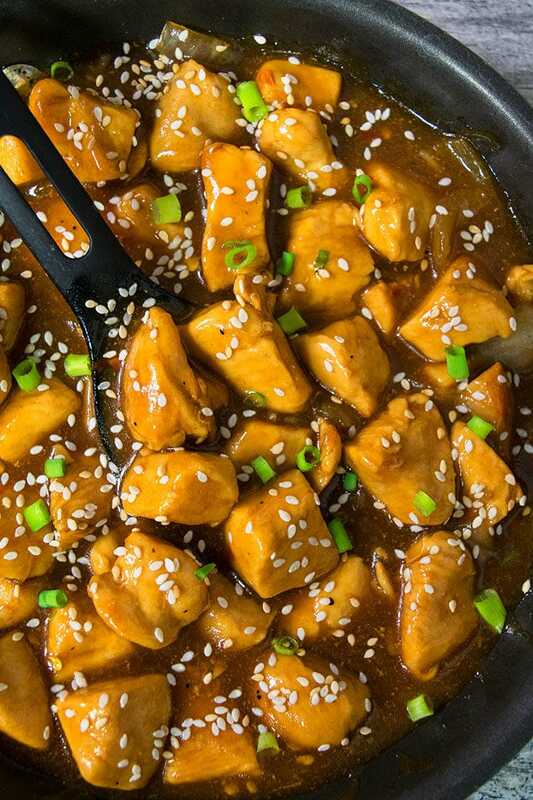 How to make sesame chicken sauce? There are many different variations. After many trials, the most balanced flavors come by combining together the following basic/simple ingredients: ginger, garlic, soy sauce, vinegar, hoisin sauce, honey, sriracha sauce, brown sugar, salt, pepper, cornstarch. Cook these ingredients over medium high heat until sauce thickens and then you can mix it in with stir-fried shrimp or chicken. 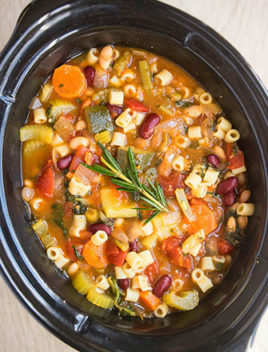 -Add frozen vegetables- Some popular choices are: broccoli, snap peas, carrots, green peppers and onions. Add them in the last 5-7 minutes until they are crisp but tender. Adding them near the end prevents the veggies from becoming over-cooked soft and mushy. –Adjust the heat– This is based on your preference. The heat is controlled by the use of sriracha sauce and red chili flakes. –Adjust the sweetness– This is also based on your preference. Add more of less honey and/or brown sugar. –Hoisin sauce is optional– You use homemade or store-bought version. It increases the Asian flavor in this recipe. –Roast sesame seeds– I highly recommend this because it enhances the nutty flavor and aroma. –2 sources of sesame flavor– It comes from sesame seeds and sesame oil. I don’t recommend omitting them or replacing them but if you must, you can use all olive oil. -Use low sodium soy sauce– Because this prevents this meal from becoming too salty. 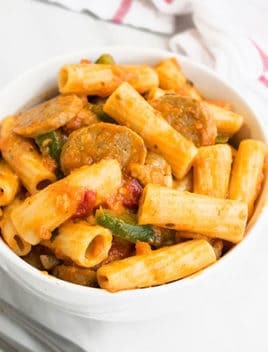 –Use dissolved cornstarch– Mix it with some water and then add it in with the other ingredients because this prevents little lumps from forming in the sauce. –Thickening the sauce– Cornstarch is a key ingredient for thickening the sauce and don’t omit it! You can also reduce the sauce by cooking, it uncovered, on medium heat for a few additional minutes until excess liquid evaporates. 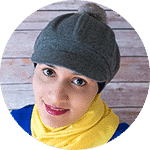 –Use nonstick pot or pan- That’s because this prevents sticking and burning. Heat olive oil and sesame oil in a nonstick pot over medium high heat. Add ginger and garlic and saute for about 1 minute until fragrant. Add soy sauce, vinegar, hoisin sauce, honey, sriracha sauce, brown sugar, salt, pepper, red chili flakes and mix until combined. Dissolve cornstarch in water and pour this mixture in the pot and mix. Cook uncovered for a few more minutes until liquid is reduced to your desired thickness. 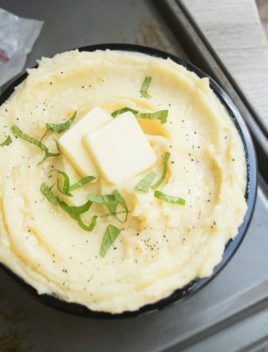 Remove from heat and garnish with sesame seeds and green onions. Enjoy! Leftovers can be stored in a sealed container in the fridge for up to 3 days and reheated in the microwave or stovetop.